Association rules are used to predict frequent web user behaviors from web usage data. These rules are formed using frequent items. The number of association rules increases as the number of frequent items increases and produces several redundant and non-informative rules. In this paper, five interestingness measures, including cosine, lift, leverage, confidence, and conviction with a constant value of support are compared based on the number of redundant and non-informative rules that they produce. Redundant and non-informative rules are a subset of rules present in the top generated rules. 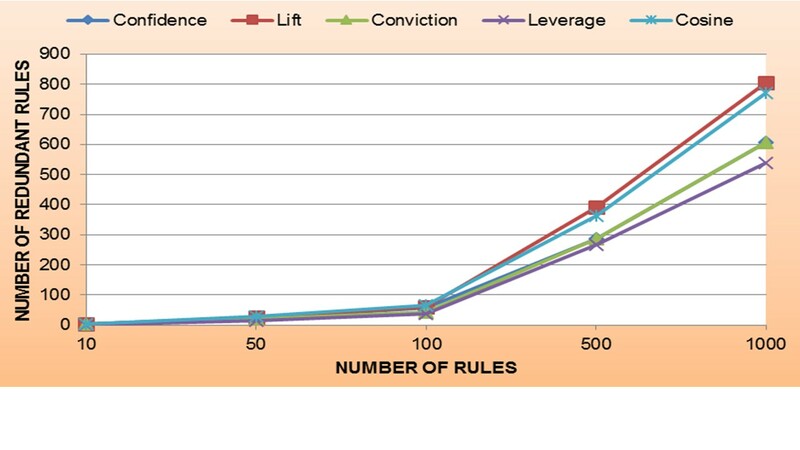 The experimental results suggested that leverage produced the least number of redundant rules in the top rules but also produced the least informative rules among all measures. Lift showed the highest number of redundant rules but the most informative rules among all the measures. In this paper, the number of redundant and non-informative rules was determined using five interestingness measures, including confidence, conviction, cosine, leverage, and lift, for a constant value of support. The top rules are listed according to the respective values of the interestingness measures, and the number of redundant rules was determined. A rule is considered redundant if it is a subset of a valid rule. It was observed that leverage had the least redundant but also the least informative rules, as the antecedent or consequent could be combined to form a superset of the rule. Lift and cosine showed a similar type of top rules and showed the maximum redundant but more informative rules compared to other measures. Lift showed maximum redundant rules, as the valid rule that was an informative rule contained several subsets of the top rules. Confidence and conviction showed a similar type of top rules and contained rules that had valid rules that could be combined. This study experimentally confirmed that no measure is consistently better than others for all circumstances; however, there are situations in which many of these measures are highly correlated with each other. The presented algorithm was used to select a small set of rules in the form of tables so that experts can select the most appropriate measure by examining the small set of tables. The scope of present work was to identify redundant and non-informative rules from the total generated rules using interestingness measures and to compare the performance of the different measures used for the same purpose. This work can be utilized to identify the relationships among buying patterns of online users, decision making in effective e-marketing strategies, designing web-based personalized systems, and other types of patterns.